I know not every person who ends up with a narcissist has low self-esteem. Narcissists also like compassionate, empathetic people and people who have a lot going for them. The narcissist knows that an empath will give them the benefit of the doubt, and the narcissist wants to “own” all the good things that happy, successful people have. But, it is true that low self-esteem is common with targets of narcissistic abuse, especially with people who have been victimized repeatedly. When I talked to one psychologist about what was going on with my ex narcopath, he concluded that I had low self-esteem, co-dependent tendencies and “poor coping mechanisms.” In other words, after a childhood of abuse and neglect, I had learned to protect myself in ways that were not assertive or healthy, but were the only ways I knew about. One of those “poor coping mechanisms” is that I often let people hurt me or upset me for weeks, months or even years before I finally get mad and let ’em have it and start confronting them with all of the abusive or inconsiderate things they’ve been doing. This isn’t unusual for people with low self-esteem, (or just people who are being gas lighted or abused in general.) Unfortunately, this is one of the ways a narcissist will make their victim look crazy or look like the abuser. They can abuse and pick on your for a long time, but the one time you react, they will never let you forget. And…if they are especially devious, they will make sure this happens in public after they’ve been whispering in your ear or harassing you behind the scenes. I have a really good book that isn’t about narcissism, but is about recovering from low self-esteem. It was recommended to me by a therapist years ago and it’s called Breaking the Chain of Low Self-Esteem . It has a matching workbook as well: The Personal Workbook for Breaking the Chain of Low Self-Esteem: Step 2 of the Sorensen Low Self-Esteem Recovery Program . I wanted to mention this book today, because it has a section that I can really relate to that talks about how quiet people with low self-esteem will react loudly after holding in their anger for a long time. I think it really feeds into the way narcissists portray us as crazy. Marcy’s response is not the behavior of an aggressive person; instead, her actions are those of a passive person who has held in her anger rather than express it immediately. Had she confronted Joan the first time, her reaction would not have been so explosive. She could have calmly shared her feelings…. By being passive, however, and holding in her feelings until her emotions are out of control, she is reacting to eight weeks of increasing anger, as she moves from a simmering anger at Joan to a seething rage. Since this book isn’t about abusers or narcissism, the people in the story are just “normal” people and Joan is just being thoughtless, but you can just imagine how this would go with a narcissist! 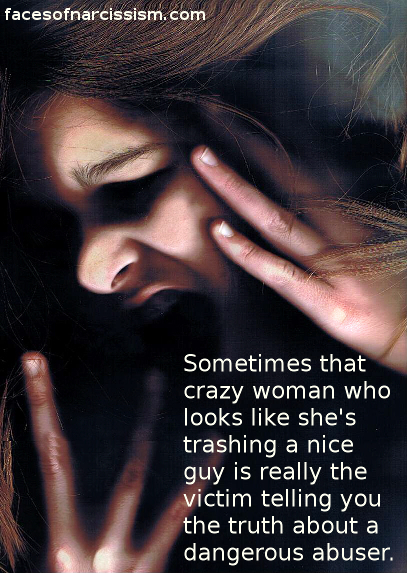 The narcissist could be pushing your buttons on purpose, abusing you, and more, but a passive person with low self-esteem might let it go on far too long, then look “crazy” when finally reacting. I remember during my brief marriage to a sociopath, I only yelled at him once, and that was after a week of intense, non-stop rage and control. It was the week after we got married! I yelled that he was crazy, he was a psychopath, and no wonder he’d never been married before. This was after he had been violent and scary for a week. After I yelled, he become even more violent and started driving recklessly and saying far, far worse than I had. But, he went to his core enablers and told them I’d yelled at him, (and of course left out what triggered it!) then played victim. There is some good advice that we cannot control people, but we can control our reactions. I think this example of being passive, then getting upset is a good example of how the narcissist portrays us as the problem. I believe in going no contact with narcissists, but in cases where that is impossible, we need to be careful to control every way we react to them. For someone with low self-esteem, that would include practicing good boundaries and building better self-esteem to have more assertive reactions instead of than passive reactions that lead to explosions. Even if an abuser or narcissist isn’t involved, I recommend this book. I’ve had low self-esteem all my life, so I could relate to so much of it.